Jonathan "Nash" Hyde (born 21 May 1948) is an Australian-born English actor, known for roles such as Herbert Cadbury in Richie Rich, J. Bruce Ismay in the 1997 film Titanic, Culverton Smith in The Memoirs of Sherlock Holmes, Warren Westridge in Anaconda, Sam Parrish and Russell Van Pelt in Jumanji, and Eldritch Palmer in the FX TV series The Strain. Hyde was born in Brisbane, Queensland, to a middle-class family. His father was Stephen Geoffrey King, a solicitor. Hyde's interest in law took him to university to study the subject but his passion for performing and the theatre led him to pursue a career in acting. Leaving for London in 1969, he was awarded a coveted place at the Royal Academy of Dramatic Art and won the Bancroft Gold Medal for excellence in his graduating year of 1972. Hyde is a member of the Royal Shakespeare Company. Among other roles, he played Ferdinand in a 1985 production of John Webster's The Duchess of Malfi. He was an original cast member of Not the Nine O'Clock News, the first series of which was pulled from broadcast because of the General Election of 1979. Hyde played J. Bruce Ismay, the managing director of the White Star Line in Titanic, Egyptologist Allen Chamberlain in The Mummy, and Sam Parrish/Van Pelt, the hunter in Jumanji. He has been in numerous films including The Contract, The Curse of King Tut's Tomb, Land of the Blind, The Tailor of Panama, Sherlock Holmes and the Case of the Silk Stocking, Eisenstein and Anaconda. He appeared in the 1989 BBC miniseries Shadow of the Noose in which he played barrister Edward Marshall Hall. He has also appeared in several television mysteries, including The Adventures of Sherlock Holmes starring Jeremy Brett and Midsomer Murders as Frank Smythe-Webster. In 2007, Hyde played Dr. Dorn in Chekhov's The Seagull and the Earl of Kent in King Lear for the Royal Shakespeare Company in a repertory company that included Ian McKellen, Frances Barber, Romola Garai, William Gaunt and Sylvester McCoy. Both plays toured together internationally, before taking up residence in the New London Theatre. The final performance was on 12 January 2008. He reprised his role of Kent in the 2008 television film of King Lear. In the final series of BBC's popular series Spooks, Hyde played Ilya Gavrik, a Russian Minister. Hyde appeared as Lionel Logue, the King's speech therapist in the West End production of The King's Speech at Wyndham's Theatre. Since 2014, he has starred as Eldritch Palmer in the FX TV series The Strain. Hyde is married to Scottish soprano Isobel Buchanan. The couple have two daughters, one of whom is actress Georgia King. Cadfael Lord Godfrid Picard Episode, "The Leper of Saint Giles"
2013 Foyle's War Colonel Galt Series 7 Episode 2 "The Cage"
2013 Endeavour Sir Edmund Sloan Series 1 Episode 2 "Girl"
Laxton in The Roaring Girl (Barry Kyle, Barbican, 1983). Kent in King Lear and Dorn in The Seagull (Trevor Nunn, Courtyard and International Tour, 2007). Archie in Stoppard's Jumpers (David Leveaux, NT Lyttelton, 2003). Captain Hook in Peter Pan (Three Sixty Entertainment) (Neverland Pavilion in Kensington Gardens, 2009). Isaac Newton ( BBC Docu-Drama). 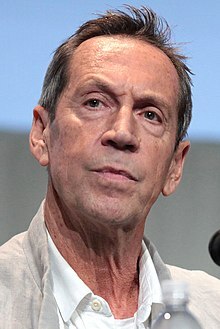 ^ Jonathan Hyde. "BIOGRAPHY | Jonathan Hyde". Retrieved 4 July 2017. ^ "'The Strain': Carlton Cuse on That Massive, "Catalyzing" Season Finale Twist". The Hollywood Reporter. Retrieved 10 March 2018. ^ "Georgia King Biography". IMDB. Retrieved 13 July 2017. ^ "Sheffield Theatres: Julius Caesar". Sheffield Theatres. Retrieved 31 December 2017. ^ "Sheffield Theatres: Frost/Nixon". Sheffield Theatres. Retrieved 18 March 2017. This page was last edited on 16 April 2019, at 14:49 (UTC).